How IPD is slowly altering the construction process. It’s not a stretch to say that the construction industry didn’t change much for decades before technology started making inroads around the turn of the century.And the forces of change are clearly at work in the current environment, encompassing the use of new and improved tools, revised methodologies, and faster approaches to the jobs at hand. Arguably, first and foremost for many construction firms is the transformation to an integrated product delivery (IPD) system. This approach emphasizes innovation and collaboration to reduce waste, cut costs and boost productivity. Leading professional associations such as the American Institute of Architects and the Associated General Contractors are spearheading the movement, creating standards and guidelines to be used in the process. The main goal of IDP is to initiate a “team effort” of the owners of construction firms, architects, engineers, managers and subcontractors. Unlike traditional construction projects, where these individuals and groups generally act independently, IDP incorporates joint planning from the outset. Each team member’s skills are maximized and the focus shifts from meeting individual expectations to collectively achieving goals. The upshot: Success is measured by the degree to which those shared goals are achieved. Traditional contracting and construction work is based on separate silos of responsibility. Practically speaking, transferring from one silo to another often results in inefficiency. The notion of breaking down silos of responsibility and requiring cooperation among all the main participants is a sea change in the construction industry. A meeting of the minds must occur before the first shovel hits the ground. This requires brainstorming sessions about objectives and ways to avoid potential problems. There’s a heavy emphasis on minimizing the risks and mistakes that can typically plague a construction project. The next logical step is to incorporate decision from the first stage into the design process, taking into account regulations and other applicable laws. Involving all team members at this stage helps reduce waste and provide overall savings. When the design is complete, the project can be executed using computer modeling and design data analysis. Frequently, digital representations using Building Information Modeling (BIM) will be included, helping to predict outcomes. (See The Expanding Role of BIM below.) Be aware that any data generated from proposed projects must be analyzed and virtually tested to help ensure the desired results. 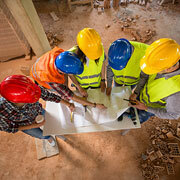 In the past, this was typically the first step for a construction company. But, when using IDP, ground-breaking begins after the general contractor and perhaps certain subcontractors have already been involved in first three stages. Typically, this is the stage where the benefits of the integrated model are realized. The project should run smoothly without delays and design conflicts; change orders and waste should be avoided; and, most importantly, the job should come in on time and on budget. If initial objectives are met, operations will continue successfully, with reduced costs and maintenance expenses. This is likely to impress surrounding neighbors, potentially prompting additional projects. Risks and rewards can be predicted. Construction results can be assessed and analyzed. Higher standards can be achieved. Regulations can be more easily observed. Construction procedural issues can be detected and accommodated quickly with minimum distraction and delay. Contracts can be prepared for all team members, filling in gaps that can appear when parties work independently. Cost estimations can be more precise. The times, they are a-changin’. New technology allows for significant advances in efficiency and accuracy that translate into upgrades in delivery methods. To be successful, however, an IPD project requires all team members to tackle new roles. This dramatic cultural change is slowly evolving. Don’t be left behind in the dust. Start adapting to the IPD framework now and embrace the shift that’s slowly changing the industry. Building Information Modeling (BIM) is a powerful tool that can be used in a collaborative process. When BIM is incorporated into integrated project delivery, it can create a solid visualization of the project and identify actual construction behavior, performance and other relevant data. It facilitates the process by clarifying intent and recording and sharing accurate information. Similarly, BIM provides reliable data that reduces the need for requests for information, change orders and rework. Practical advice: Require all the parties to use BIM and to share the information electronically.